If you're looking for a way to feed a large group, Noriega Teriyaki is a excellent choice. Customers have used our spacious restaurant to host wedding rehearsal dinners, red egg & ginger parties, graduation parties, baptismal receptions and other celebratory events. 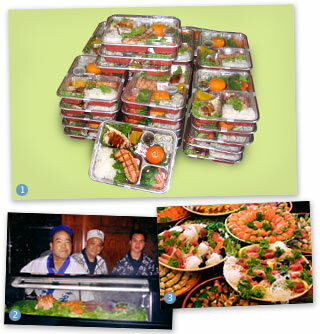 Groups gathering in their own venues, corporate lunches for example, can order our bento boxes or party trays for takeout or delivery. Our bento boxes are packed with a combination — your choice — of sushi, sashimi, rice, teriyaki dishes, steamed veggies and whole fruit. Nothing fills a room with glee like a stack of our bentos! Our sushi/sashimi trays are the life of a party and a reason for celebration in themselves. Colorful, healthy and delicious, they are also practical and flexible. Customize them to your taste, and if more people show up then you expected, simply order more. Finally, what goes better with fresh fish than a live sushi chef (aside from rice and nori)? Our experienced chefs have been known to make housecalls, carting their refrigerated case with them. Ask us about our on-site services.